Pour the juice and scatter the zest of the first lime into a shallow dish big enough to fit the fish in one layer. Swirl the juice around so it covers the entire surface of the dish. Lay the fish on top and pour over the lemon juice. Strip the thyme leaves off the stalks and crush them with a pinch of salt and the white pepper using a pestle and mortar to make a rough paste. Tip the thyme paste over the fish and gently massage it in, taking care not to break up the flesh at all. Pour the rum over and give it one last rub. Cover and leave to marinate out of the fridge for about 1 hour. Heat the oil in a wide shallow pan with a lid. Throw in the onion rings and cook for 4-5 minutes until they begin to soften. Tip the coriander, garlic, tomato slices and sugar in with the onions, stir and cook for about 3-4 minutes until the tomatoes begin to release their juices and everything smells sweet. 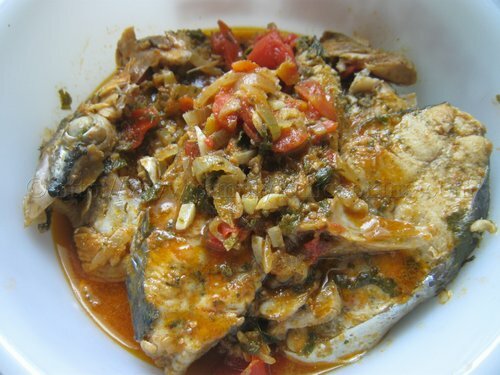 Lift the fish from its marinade and nestle it in the pan among the onions and tomatoes. Pour over the marinade, 3 tbsp of water and the Angostura bitters, if you are using it. Cover the pan and gently cook for 6-8 minutes until the fish flakes easily and the onions are softened but still have some bite to them. Season with salt and pepper. Serve with basmati rice or boiled potatoes and steamed vegetables.